Nagpur, April 11: RSS chief Mohan Bhagwat Thursday said voters should exercise their franchise for any candidate, instead of opting for the None of the Above (NOTA) option available on the electronic voting machines (EVMs). Bhagwat was talking to reporters after casting his vote in Maharashtra's Nagpur constituency, where Union minister Nitin Gadkari is the BJP's candidate. "Voting is our duty. Everyone should vote," the RSS chief said. 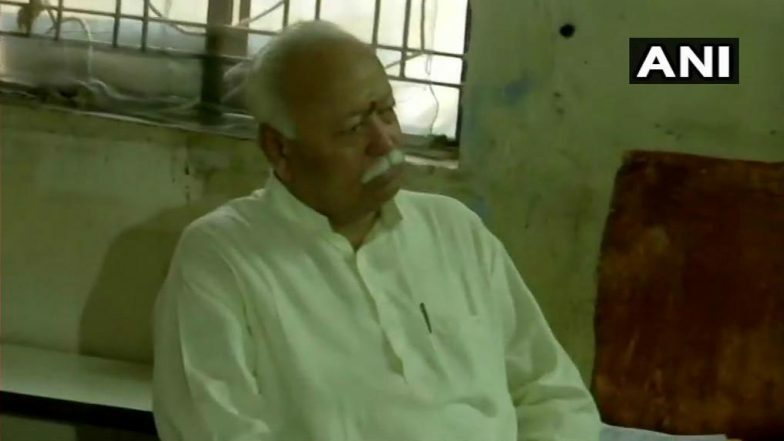 Mohan Bhagwat Critical of Modi Government? RSS Chief Says Unemployment And Inflation Increased. Voters should not use the NOTA option, he added. Bhagwat along with Rashtriya Swayamsevak Sangh (RSS) general secretary Bhaiyyaji Joshi arrived at a polling booth at Bhauji Daftari School in Mahal area here around 6.50 am. Talking to media-persons after exercising his franchise, Bhagwat appealed people to come out to vote in large numbers. "Voting is necessary and a sacred responsibility of all. Vote for national security, development and identity," he said. On the NOTA option, Bhagwat said one has to say what he/she wants. "Being quiet does not work. You have to say yes or no," he added. Joshi also appealed people to support voting. "People should express their choice," he said, and asked them to vote for the candidate whom they think is suitable. "I hope the government elected after polls will work in the interest of the nation," he added. Lok Sabha Elections 2019 Phase-I Voting Live News Updates. Polling for the first phase of Lok Sabha elections began at 7 am in Maharashtra's seven constituencies - Nagpur, Wardha, Ramtek, Bhandara-Gondiya, Chandrapur, Gadchiroli-Chimur and Yavatmal-Washim. All these constituencies are located in the state's Vidarbha region.